Derry’s ‘Glass’ was of the half full variety on Sunday following an impressive minor victory over Down in the traditional curtain raiser. Damian McErlain’s side produced an excellent, controlled second half with the ‘Glass’ in question - Glen’s rising star, Conor - at the heart of everything good about the Oak Leafers. Level seven times by the midway point of the second period, McErlain’s young team was forced to dig deep against a defensive Mourne 15 but when questions were asked, they found some superb answers. Down had levelled and moved menacingly ahead at 1-7 to 0-9, 17 minutes into the second half. Derry needed a response and it arrived in spectacular fashion through Patrick Coney’s superb solo run and goal. The Loup player picked the ball up around half-way but as Down backed off expecting him to pass, Coney just kept going, leaving a number of Down defenders trailing. His lobbed finish may have been intended to go over the bar but it caught Down keep Jack Heaney out and drifted beautifully into the net. Two minutes later, Glass had set up Slaughtneil’s Shane McGuigan to burst through the middle and fire Derry into a five point lead with the most emphatic of finishes. When, seconds later, Glass sent over a free Derry had moved from 0-9 to 1-7 to 2-10 to 1-7 in three minutes. Game over. As impressive as the seven point swing was, Derry reaction to an early second half setback was perhaps the most telling feature of the game. The first half was tight, typified by hard running half-backs on both sides and chances at a premium. Derry included Steelstown’s Eoghan Concannon who acquited himself brilliantly among the half-backs but there was nothing between the teams. Yet the longer the first half went on, the more control Derry gained. The Derry midfield of Jack Doherty and Patrick Kearney provided an excellent platform for victory but it was the elusive Glass who pulled the strings from a deep starting position. The teams had been score for score at 0-4 a-piece when Derry went through the gears, Shea Downey rounding off a superb three point burst with the best score of the half to send Derry in 0-7 to 0-4 ahead at half-time. Within two minutes of the restart that three point lead was a one point deficit as Tiarnan Rushe slippd all to easily through to Derry rearguard to hit the net with Aaron Magee adding a point. This was now the Championship test Derry minor teams had failed in recent years but not McErlain’s men whose composure and control of the game was superb. The seven point salvo swung the game but it was the manner in which they controlled the difficult parts of the hour that won it. The league exertions in Ballybofey against championship favourites, Donegal, had prompted a rethink of Derry tactics and while Sunday wasn’t perfect, there was a nice blend of defensive solidity and attacking threat. Down’s conservative approach made things difficult and in Rushe and Aarom Magee, the Mourne men had two high quality forwards which the Derry defence did well to keep quiet and Derry still have Tiarnan Flanagan and Barry Grant to hopefully come back into the panel which will increase McErlain’s attacking options for the semi-final. “You have to be disciplined at this level,” explained the Derry manager, “You cannot afford to be going a man down and that has been drummed into them the whole time. The next day our discipline has to be 100 per cent, everything has to go our way in terms of how we play and in what we want to achieve from the game. We have to take each quarter at a time and try and impose our game on the opposition. That next game will be a step up again for McErlain and his players but on the performance there is plenty of room for optimism. 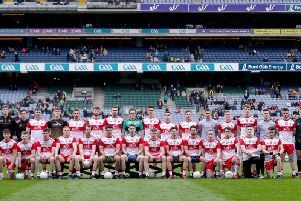 Derry: Callum Mullan-Young; Niall Keenan, Conor McGrogan, Eoghan Concannon; Shea Downey (0-1), Michael McEvoy, Conor Maunsell; Patrick Kearney, Jack Doherty (0-2); Conor Glass (0-3, 3f), Seamus Higgins, Patrick Coney(1-0); Fergal Higgins (0-2), Francis Kearney, Shane McGuigan (1-2, 1f). (Subs) Brian Cassidy for S Higgins, 39mins; Eunan Murray for P Kearney, 47mins; Michael Mullan (0-1) for S McGuigan, 58mins. Down: Jack Heaney; Conor Cox, Patrick Murdock, Dean McLaughlin; Charlie Carr, Mark Harte, Pierce Laverty; Frank Aiken, CJ Barr; Deaglan Morgan (0-1, 1f), Jody McGovern, Aaron D’Arcy (0-2); Conall Gordon, Tiarnan Rushe (1-2), Aaron Magee (0-2, 2f). (Subs) PJ Davison for J McGovern, 39mins; Darragh Connolly for F Aiken, 41mins; Nic Turkington for C Gordon, 47mins; Owen Donnelly for T Rushe (Black Card) 56mins; Oisin McConvey for C Carr, 60mins.